Bat houses can make a great addition to your property. Bats consume large quantities of insects including mosquitos, grasshoppers, flies, gnats and crickets. Small brown bats can eat 500 - 600 insects per hour. If you are seriously looking for a good bat house, these are them. If you search the web you are going to run into all kinds of advice as to where bat houses need to be hung, how high, what color they need to be, whether or not they need internal mesh and more. My first encounter with bats was a group that decided to nest in my grandfathers' chimney of all places. My next encounter was a group that nested behind a white window shutter on the second floor of my parents house on the east side. Third encounter was with a group that nested under a white eave on the first sory of a house facing north. All three of these encounters go against almost all the recommendations that I have read. In the following paragraphs I will list the common "published" recommendations for bat houses. Bat houses should be mounted 15 feet or higher on a pole or structure facing south or west for maximum heating. Mounting in trees is not recommended. However, if that is your only option, make sure to mount the house below the limb line. Bats will not fly through leaves and branches to get to the house. It is recommended that bat houses be mounted with a 1/4 mile of a water source such as a stream, pond or lake. 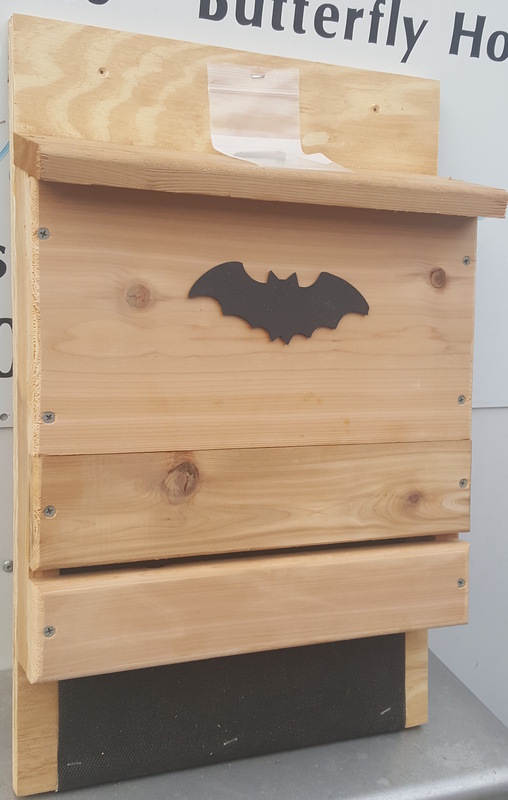 Our bat houses are constructed using only the best materials and assembled with exterior wood screws to survive even the worst of weather conditions. Our bat Houses are made with either cedar (western red or eastern) or pine. Cedar weathers extremely well with no additional finishing. Pine houses are painted with safe exterior water based latex. Inside of houses are not painted and chambers are either grooved or have mesh installed to make it easy for the bats to anchor themselves. Bat house chambers are spaced 3/4" to 1" apart as recommended by bat conservationist. Click here for a printable bat information sheet containing mounting and care tips.